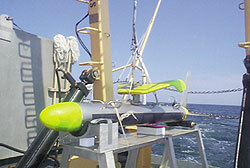 The Whiting's digital multibeam, side-scan sonar, known as the towfish, can cover a lot of ocean floor. The National Oceanic and Atmospheric Administration has again joined the search for a downed plane off the coast of Massachusetts. The Coast Guard last week asked NOAA to send the Whiting, an advanced hydrographic survey ship that uses advanced side-scan sonar to map the ocean floor, to help locate the wreckage of EgyptAir Flight 990. NOAA dispatched the 163-foot Whiting instead of the 90-foot Rude, which the agency used to locate the wreckage of John F. Kennedy Jr.'s downed plane in July [GCN, July 26, Page 1]. The larger ship can better handle rough seas, and waves were as high as 20 feet in the area being searched last week, said Lt. Cmdr. Gary Noll, chief of the hydrographic system and technology programs for NOAA's Office of Coast Survey. The ship can also go faster'10 knots vs. the Rude's 5 knots'and cover more ocean with its digital multibeam, side-scan sonar than the Rude can with its analog single-beam, side-scan sonar, Noll said. The Whiting, stationed at NOAA's Atlantic Marine Center in Norfolk, Va., uses commercial hardware and software to process sonar images. The agency helped develop the multibeam, side-scan sonar through a small-business innovative research grant to Klein Associates Inc. of Salem, N.H. The Coast Guard asked for the Whiting's help after the guard began searching with the Navy for the Boeing 767 off the coast of Nantucket Island early Oct. 31. The plane plunged from 33,000 feet at a rate of 23,100 feet per minute, and all 217 people on board were killed. The FBI and the National Transportation Safety Board have begun investigating the crash. After the Whiting got the call late last Monday, the ship, under the command of Lt. Cmdr. Gerd Glang of NOAA's Commissioned Corps, steamed from Delaware Bay to the crash site. It began operations early Tuesday, Noll said. The Whiting's sonar system provides a distinct advantage over the Rude's system because it has five beams that scour the ocean floor, Noll said. Because the ship can go faster and cover more ground, NOAA analyzers receive a substantial increase in the data rate'1G an hour, three times faster than that of the Rude, he said. To help locate the wreckage in the 250-foot waters, the Whiting lowered the side-scan sonar, known as the towfish, into the ocean to make sweeps of the sea floor. The stainless-steel towfish uses two multichannel acoustic arrays and a pressure bottle that houses all the electronics and sensors necessary for sonar acquisition, altitude sensing, system control and telemetry, Noll said. Via an electromagnetic cable, the towfish sends up data in pulses to a Klein Tranceiver/Processor Unit on the ship, which generates images. The unit then sends the images over a 100Base-T Ethernet LAN to an Isis sonar acquisition computer from Triton-Elics International Inc. of Watsonville, Calif.
After some rough processing, the Isis moves the images to an SGI Origin2000 server running Irix 6.53. From the SGI Octane workstations, the NOAA crew can tap into the images housed on the server.